Cable and broadcast news networks have given scant coverage to the FCC’s planned December 14 vote to repeal net neutrality regulations. Between November 28 and December 12, the six major cable and broadcast news networks combined devoted roughly 27 minutes to the story. 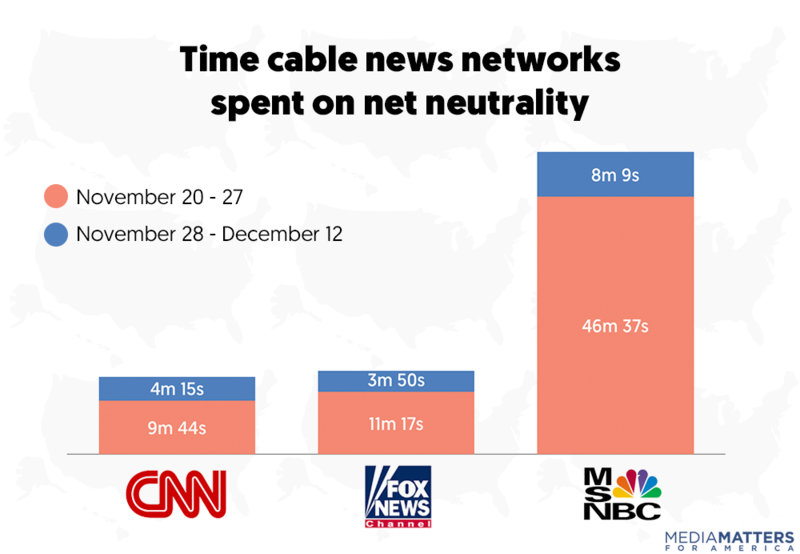 Since November 28, cable news has given net neutrality minimal coverage: approximately four minutes each on CNN and Fox News and more than eight minutes on MSNBC. 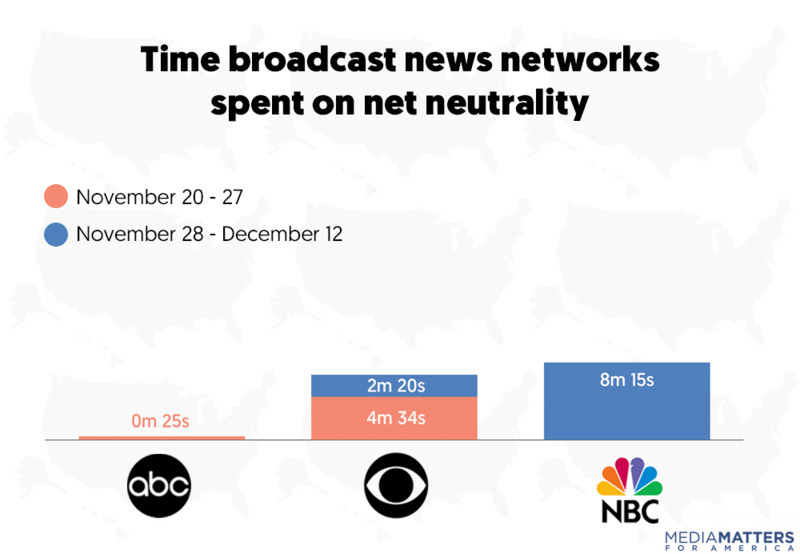 Since November 28, broadcast news networks have given net neutrality minimal coverage on their morning and evening news programs and Sunday political talk shows: more than eight minutes on NBC and a little more than two minutes on CBS. ABC did not cover net neutrality in this time period. Since November 20 when news first broke on the upcoming Federal Communications Commission (FCC) vote on a proposal to dismantle net neutrality regulations, the six networks have devoted a combined one hour and 39 minutes to the story, with MSNBC leading in coverage with nearly 55 minutes. NBC did not address net neutrality until Sunday, December 10, when it ran segments on Today and Nightly News with Lester Holt -- nearly three weeks after news first broke about the upcoming FCC vote. FCC chair Ajit Pai gave four interviews during the study period -- all to conservative-friendly media. ABC has aired no additional coverage since its report on November 21. Since ABC aired one story on net neutrality in the wake of breaking news about the upcoming FCC vote, the network hasn’t aired any more stories on the topic. Overall, cable and network news have spent just one hour and 39 minutes on net neutrality. MSNBC devoted the most time to net neutrality over the last three weeks, with almost 55 minutes of coverage. AM Joy, hosted by Joy Reid, had the largest share of that coverage -- approximately 13 minutes. Fox News and CNN followed far behind with 15 minutes and 14 minutes, respectively. The bulk of Fox News’ coverage was friendly interviews with Pai. NBC, CBS, and ABC gave net neutrality eight minutes, almost seven minutes, and 25 seconds, respectively. NBC and MSNBC are owned by internet service provider Comcast, which stands to benefit from the repeal. MSNBC repeatedly mentioned in its coverage that it is owned by Comcast, and NBC described Comcast as “NBC parent company” in both its reports. A merger between Time Warner -- which currently owns CNN -- and internet service provider AT&T is currently pending review, which was covered during a November 26 Reliable Sources segment on the channel. Media Matters searched the Snapstream database of television video transcripts for any mentions of “net neutrality,” "Federal Communications Commission,” or “FCC” from November 20 to December 12, 2017 on ABC’s Good Morning America, World News Tonight with David Muir, and This Week with George Stephanopoulos; CBS’s This Morning, Evening News, and Face the Nation with John Dickerson; NBC’s Today, Nightly News with Lester Holt, and Meet the Press with Chuck Todd; and all-day programming on the three major cable news networks -- CNN, Fox News Channel, and MSNBC. We also searched the Nexis transcript database and the iQ Media transcript database for the same terms. Since November 23 was Thanksgiving, some networks altered their regularly scheduled programming on that day. We included any segment about FCC chair Ajit Pai’s proposal or the FCC vote scheduled for December 14 following Politico’s November 20 report on the proposal. We timed all such segments from start to finish, and excluded any breaks to other news or to commercials. We also included portions of multi-topic segments when two or more speakers discussed the FCC chair’s proposal or the scheduled vote on the proposal with one another. In those instances, we only timed the relevant discussion and not the entire segment. We excluded passing mentions of the proposal or its vote, and we excluded teasers of upcoming segments about the proposal or its vote.